No details of the missile test could be learned, but the test was believed to have been carried out from China’s Wuzhai test facility. 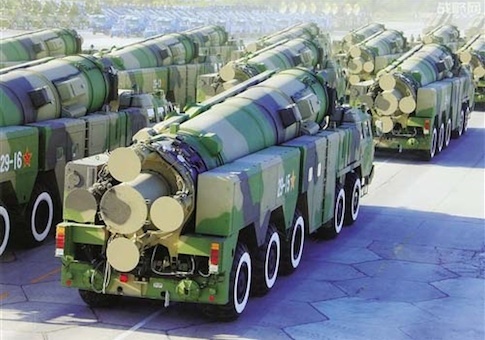 The new DF-31B is the latest addition to China’s rapidly growing nuclear missile arsenal that includes older silo-based missiles and five other road-mobile missiles. They include the long-range DF-31, DF-31A and DF-41 ICBMs, intermediate-range DF-26Cs, and medium-range DF-21s—a missile the Chinese have developed into a dual, nuclear-conventional weapon that includes an anti-ship variant. A DF-21 variant also is believed to be used as China’s anti-satellite missile system. China also has deployed new submarine-launched missiles called the JL-2 that are based on new missile-firing nuclear-powered submarines that the U.S. Navy has said will begin their first sea patrols this year. China also is working a high-technology hypersonic strike vehicle that is launched atop a missile and travels at extremely high speeds along the edge of the earth’s atmosphere. The glide vehicle is being designed to deliver a nuclear warhead through U.S. strategic missile defenses. "They have an extraordinary selection of cruise missiles, and a ballistic missile force that they developed," Adm. Jonathan Greenert, chief of Naval Operations, told a security forum in August, adding that in a future conflict, China’s missiles pose the most serious threat. "If [a conflict is] in their backyard, I’m a little worried about their ballistic missile [force] because of its reach," Greenert said. The latest missile test, which was not announced by the Chinese government, highlights Beijing’s largely secret strategic nuclear forces buildup. Fisher said the DF-31B also might be a silo-based missile or one designed specifically for China’s so-called "Great Underground Wall"—a network of 3,000 miles of tunnels and underground nuclear facilities that was first revealed several years ago. The testing of a third DF-31 variant, along with Moscow’s nuclear weapons modernization program "places greater pressure on Washington to proceed with modernizing America's nuclear deterrent," Fisher said. The Pentagon’s most recent annual report on the Chinese military states "The Second Artillery continues to modernize its nuclear forces by enhancing its silo-based intercontinental ballistic missiles (ICBMs) and adding more survivable mobile delivery systems."